Hunter in the Translational Biophotonics & Imaging Lab. 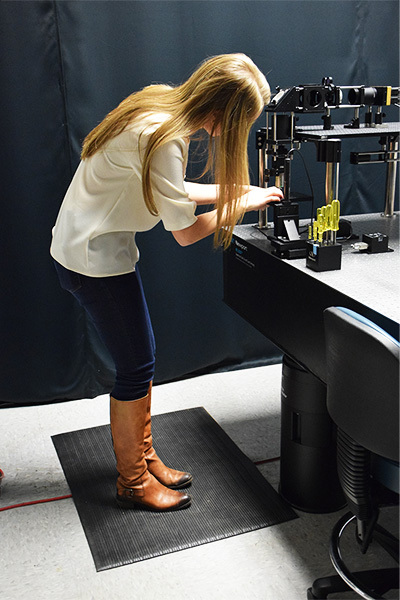 Courtney Hunter is a student in the Biomedical Engineering Department at the University of Arkansas. 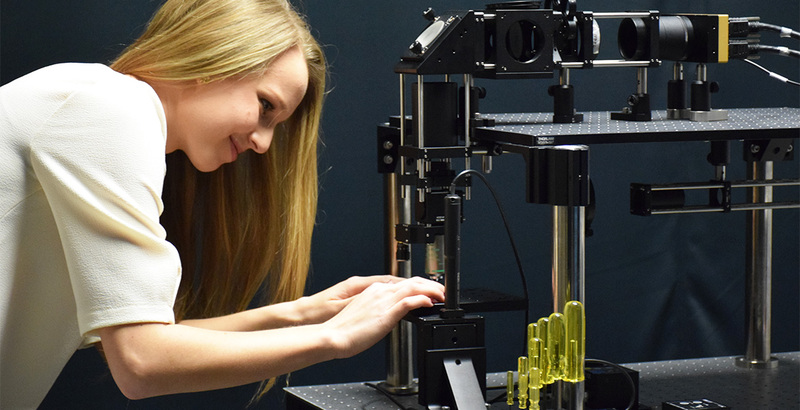 She works under Dr. Timothy Muldoon at the Translational Biophotonics & Imaging Lab, and was recently awarded a SURF grant to continue her research work. UArk BME: Did you come to the U. of A. knowing you wanted to study engineering? Hunter: I actually came to the U. of A. with the intention of getting a degree in biology through the Fulbright College of Arts & Sciences. That had been my plan since I was a freshman in high school. I knew after I started my freshman year that biology was not the major for me; however, I did not know what else was out there. I met someone in my Cell Biology class during the spring of my freshman year (2014) who told me that he was a biomedical engineering major. That immediately sparked my interest. I had never considered engineering before, and I definitely did not know biomedical engineering was even an option. I did some online research and studied the course guide. The more and more I looked into it, the more I realized this was something I really wanted to do. I discussed it with my parents, and they were open to whatever I wanted to do. As I was finishing my freshman year, I changed my major to biomedical engineering, and I have never looked back. Kinan Alhallak, the student who introduced me to the major in the first place, is now a fellow researcher, classmate and a good friend. UArk BME: What’s it been like working with Dr. Muldoon here at the U. of A.? Hunter: Working with Dr. Muldoon has been very rewarding. Everyone in the lab can tell he really cares about our individual success and the success of the group as a whole. When I joined as an undergraduate researcher in June 2015, I did not think I would be as involved as I am now. He really tries to give us as many opportunities as possible. Dr. Muldoon is also a wonderful teacher. He explains new concepts in detail, and always asks me detailed questions to make sure I understand. I’m grateful to have him as a research mentor and role model. UArk BME: What was the application process for a SURF grant like? What was the most challenging part of the process for you? Hunter: The application process was tedious. The application requires 12 components that have to be formatted in their own unique way. Dr. Muldoon was very helpful, considering the application required multiple things from him, too. I think the most challenging component for me was the 5-page description of my proposed research. I had never written a proposal for a grant before. It requires you to think a year ahead and write about what you will be doing. In comparison, most writing we do is about what has already been done. As such, it was especially challenging to jump right into this “backwards” writing. I also had an enormous amount of help from the graduate student I work with, Josh Hutcheson. He helped me with the whole application process, and was with me through every step making sure I understood all of the concepts and proofreading my many drafts. I definitely would not have accomplished what I have without his help! UArk BME: How did you react when you found out you’d won the award? Hunter: I was very surprised. I had to read the letter a couple of times to make sure I was not mistaken. I was home for Thanksgiving when I got the letter, so my family and I got to celebrate together. I immediately texted Josh, the graduate student I work with, to let him know. His response: “That’s incredible.” I also emailed Dr. Muldoon to let him know the great news. Needless to say, we were all very excited. It was definitely a great way to begin the Thanksgiving holiday for all of us! UArk BME: Can you describe in detail the research you’ll be doing with the SURF Grant? Hunter: We have designed a light sheet confocal microscope with a linear sensor capable of electronic whole slide imaging of cells. Whole-slide imaging is an emerging technology in the biomedical sciences and shows promise in the area of image cytometry. The linear sensor allows for fast data transfer with short exposure times to aid in imaging speed and low image saturation. The whole slide is scanned across the light sheet using a raster motion, controlled by a custom MATLAB graphical user interface, for automated imaging of the entire slide. The system is composed of a 450 nm laser coupled to a single mode fiber converged by a cylindrical lens to create a sheet of light at the back aperture of an objective lens. The fluorescence signal is then filtered and focused onto the linear sensor. We will use this system to image a co-culture of oral cells and cancerous oral cells to calculate nucleus to cytoplasmic (N:C) ratio, which is a well-established dysplastic marker. We have employed a filter wheel to simultaneously co-align multi-wavelength emissions in a single image. This will be utilized for a three-part differential of white blood cells by red-green ratio. We will compare this technique with the diagnostic speed and accuracy to the industry standards of a flow cytometer and hematology analyzers. UArk BME: Any advice for other U. Ark. students looking to apply for awards? Hunter: Award applications can seem intimidating with multiple components, so I think the most important thing for people to remember is to put forth their best effort when completing each component of the award application. Additionally, surround yourself with others who want you to succeed and who will help you throughout the application process. I was lucky enough to have the experienced guidance of Josh and Dr. Muldoon during the process. The support from others and self motivation will help you surpass the intimidation. It is also important to have the mentality of a winner; do not count yourself out before you apply. With a positive attitude, support and hard work, you have a recipe for success. UArk BME: What is it like being an engineering student in the College of Engineering here at the U. of A.? Hunter: It is definitely a challenge, but not one you’re going through alone. Some people may find it surprising that the whole engineering community here at the U of A is so tight-knit—everyone is friends with everyone. As a biomedical engineer, I am very close with people in my major, especially the ones in my academic class. There are only about 50 of us, give or take, that are juniors, so we all stick together. As an engineering student, I also have friends in all of the different disciplines of engineering. We all got to know each other by forming study groups during our Calculus and Physics classes, which are common to all engineering degrees. In the course of sharing those general engineering classes, we became friends. UArk BME: You are obviously very committed to your research. Are you involved with any other activities on campus? Hunter: I am involved in a variety of activities on campus, both related to engineering and not. I am a peer mentor for the Freshmen Engineering Program. I meet individually with eleven freshmen engineers once a week. It is a fantastic part of the Engineering college that allows freshmen to understand that their challenges are common and conquerable. I am also VP of Member Development for my sorority, Delta Delta Delta. My role is to serve on the executive board and oversee academics, new members and risk management. I also serve as an officer of the Biomedical Engineering Society on campus. I am the Public Relations chairman, so I work primarily on social media and public outreach. Being involved on campus has been a great way to make friends and develop leadership qualities. Along with research, it all definitely keeps me busy! UArk BME: Any plans for after graduation? Hunter: I hope to attend medical school after I graduate. I apply this summer, so fingers crossed! It has always been my ultimate goal to be a medical doctor. While in medical school, I would like to continue doing research. I think research is the ultimate challenge. 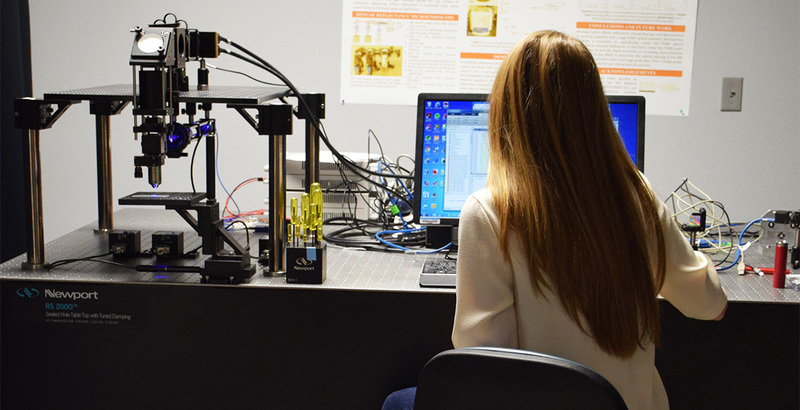 Researchers take an idea and modify it until they make something truly beneficial. I really love it! UArk BME: A Biomedical Engineer learns she is going to be stranded on a deserted island, and will be allowed to bring only three items with her. What does she bring? The biomedical engineer in me would bring a water filter. Clean water is essential in avoiding disease and dehydration. Also, no one prefers dirty water if they can avoid it. The cold-natured/hungry part of me would bring a very, very large box of matches. I would use the matches to build a fire for warmth and to cook. Finally, the social side of me would bring my little sister, Anna Claire. Assuming I would be there for a long time, I would hate to be there alone, and I know she would keep me company and entertained. As an added bonus, Anna Claire is also pretty resourceful and has some camping experience.